This building is situated in Renmin Road, in the heart of the CBD. This serviced office provides a range of spaces and amenities to suit your business requirements, including meeting rooms and reception services. The centre is in Huishan EConomic Development area. it is only 500 meters away from the weir bridge station of subway line 1. The centre provide complete supporting resources, including open office area, independent office room, meeting room, coffee area, reading leisure area, road show hall and Shared kitchen. The centre is surrounded by banks, hotel and restaurant. This is a 5A office building. This impressive and modern multi-functional building provides a landmark addresss for your business from the 25th floor in the core of Wuxi with direct access to Victory Gate metro station. 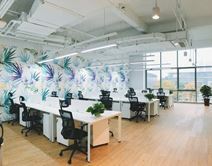 The fully furnished and flexible office space is surrounded by a diverse mix of companies in the financial, technology, real estate and trading sectors.